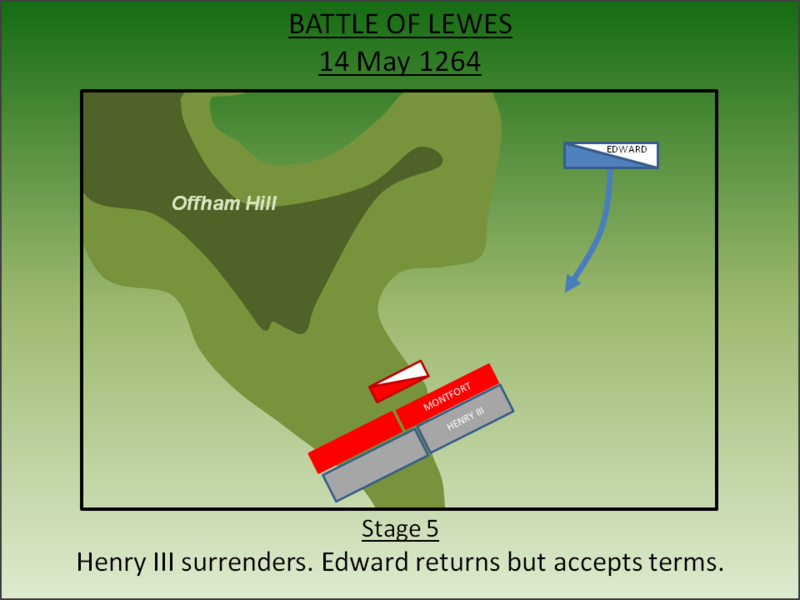 Faced with Baronial opposition over his rejection of the Provisions of Oxford, Henry III had deployed with his forces to Lewes in order to rest and reinforce his army. However Simon de Montfort, Earl of Leicester marched to intercept and in the subsequent Battle of Lewes (1264) defeated and captured the King. In 1216 England was engulfed in the First Barons War where senior Anglo-Norman magnates were fighting to overthrow King John for his repudiation of Magna Carta. The accession of the young Henry III, coupled with a policy of reconciliation by the new regime and victories at a number of key battles, had seen that war end. However, medieval society relied upon a strong King who could strike a balance between exercising his authority and managing his Barons. Henry III lacked this skill and by the late 1250s the country was once again on the cusp of civil war as the Baronial faction was angered by his autocratic rule and promotion of favourites. Matters came to a head in 1258 when Henry III was forced by his Barons to agree the Provisions of Oxford; a treaty which required the King to surrender key powers, particularly on taxation and inheritance, to a council headed by Simon de Montfort, Earl of Leicester. In a parallel with his father and Magna Carta, Henry III sought and was granted Papal annulment of the Provisions. This was granted in 1261 but the Baronial faction was too strong and so the matter was eventually placed in the hands of Louis IX of France to act as arbitrator. In January 1264 in the Mise of Amiens, Louis annulled the Provisions of Oxford. The decision ignited the Second Barons War (1264-7) with the rebel forces being headed by Simon de Montfort, Earl of Leicester. The early months of 1264 saw both the Royalists and the rebels move to secure key castles, the ultimate instruments of control in medieval society. Henry III's strongest support was in the Midlands which he secured by reducing rebel garrisons in Northampton, Leicester and Nottingham before relieving Rochester Castle which was under siege by a rebel army. The King then captured Tonbridge before marching south to Lewes, where the castle was loyal to him, hoping to rest his army and acquire reinforcements before engaging the rebels. Montfort was keen to resolve the war before the King became too strong. He marched his army to Fletching, some 8 miles to the north of Lewes. There he made overtures to the King who rejected them out of hand writing to Montfort that "We therefore let you know that you are all defied as public enemies by each and all of us your enemies, and that henceforth whenever occasion offers we will fight with all our might...to damage your persons and property...". Having received this message, on the morning of 14 May 1264 Montfort moved his army to Lewes ready for battle. 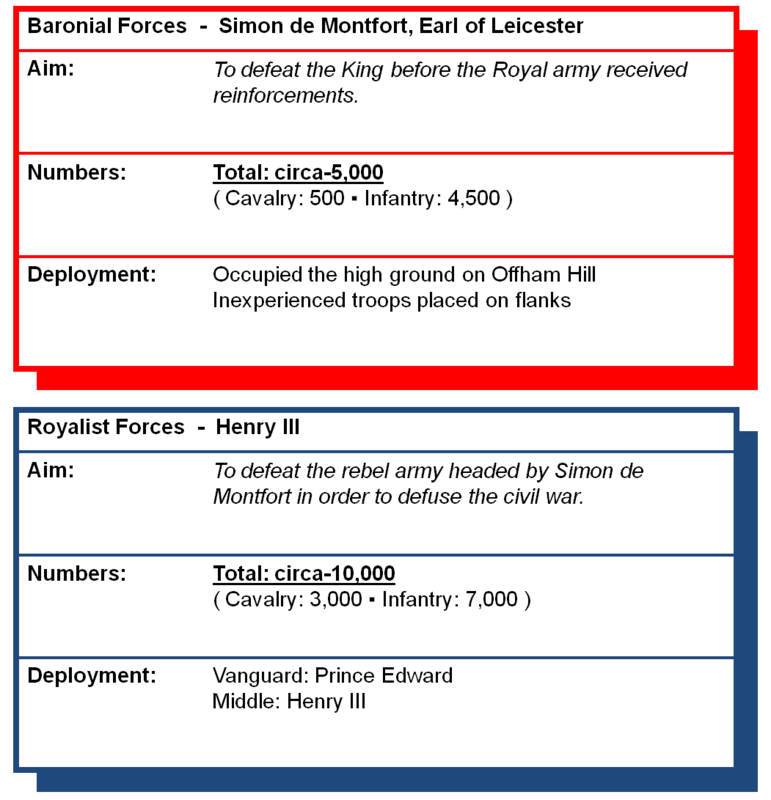 The Royalist army was significantly larger than the rebels - perhaps as much as twice the size. The battle was fought on 14 May 1264. 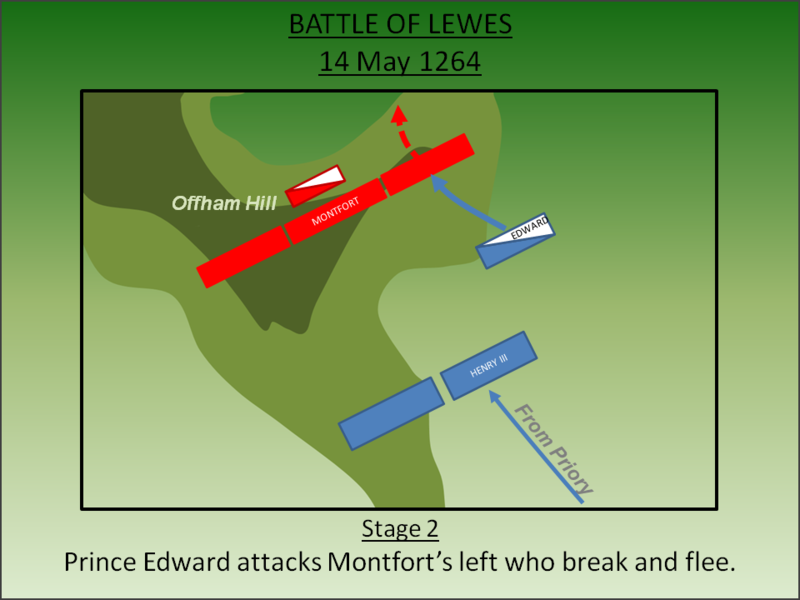 Montfort’s forces approached Lewes from the north. The main Royalist army was camped around Lewes Priory, to the south of the town, whilst Prince Edward was at Lewes Castle with the heavy cavalry. 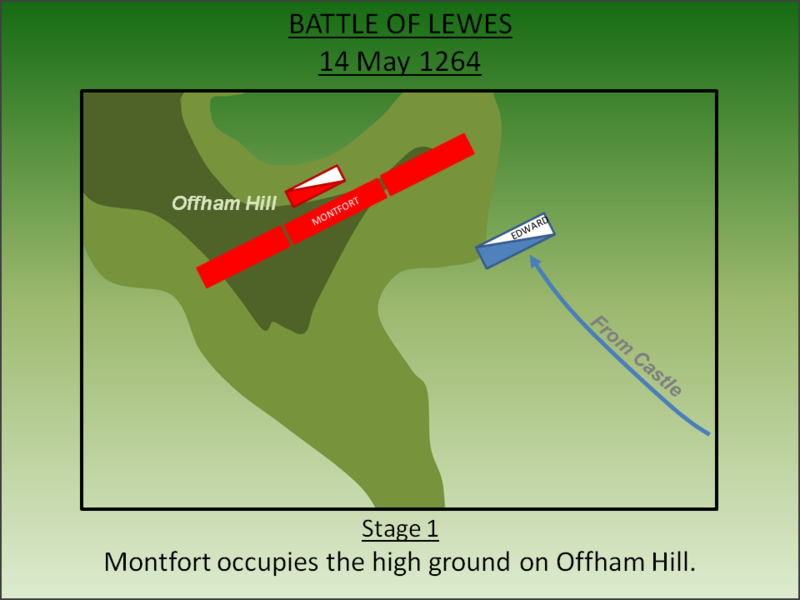 Montfort immediately occupied the high ground at Offham Hill overlooking the town. His army consisted of a large number of inexperienced and untested troops, many drawn from London, which he positioned on his flanks whilst his experienced men-at-arms were placed in the centre. As soon as Prince Edward heard of Montfort’s deployment, he mobilised his force and rode out to engage them without waiting for his father to join him. Edward launched an assault on Montfort’s left which consisted predominantly of untrained recruits. Faced with Edward's heavy cavalry, they broke and fled. Edward pressed home his attack and pursued the fleeing troops effectively leaving the field. Concurrently Henry's infantry force had arrived and now had the unenviable task of attacking uphill without heavy cavalry support. Montfort’s troops made good use of the higher ground. 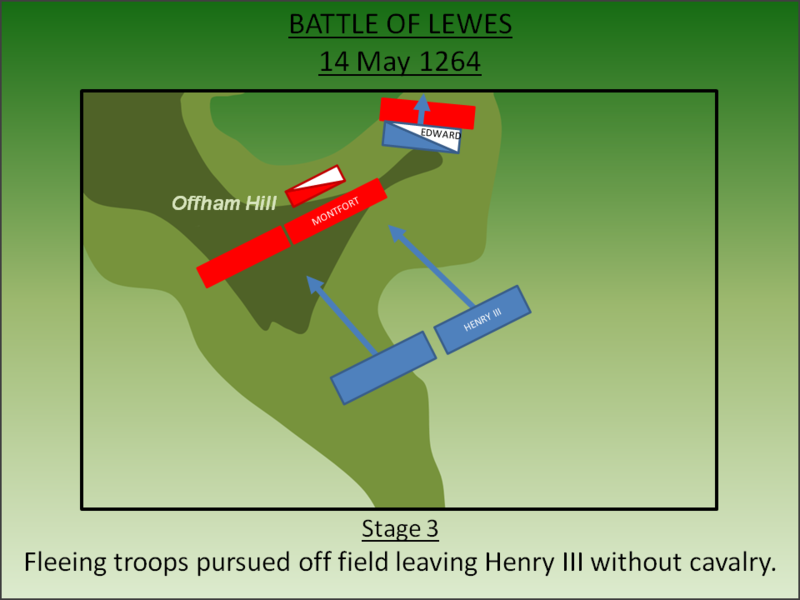 Henry’s advance was stalled and then his forces pushed back down the hill towards the Priory. Order within the Royalist ranks broke down and the army collapsed into rout. In the retreat Henry III was captured and the rebels swept into the town although the castle refused to surrender despite the King's predicament. Precisely how long Edward was away from the battlefield pursing the broken troops of Montfort's left flank is uncertain. By the time he returned however the Royalist army had been broken and the King was in custody. Edward was minded to carry on fighting but with the rebel forces now in the narrow streets of the town and no order amongst the scattered infantry to support him, it was pointless. Reluctantly he accepted Montfort’s peace terms. According to the Chronicle of St Pancras Priory at Lewes, Royalist casualties in the fight were 2,700. Crucially though both Henry III and Prince Edward were in Montfort’s custody enabling the Earl to effectively rule in the name of the King. But it was not to last; Edward escaped, gathered forces and surprised Montfort at the Battle of Evesham the following year. Montfort was killed and Henry III restored. Historians hotly debate the Montfort era with some hailing it as one of the fledgling moments of democracy in England. It is certainly true that in his short reign the Earl extended representation but then Edward, once King, did similar as a tactic for managing dissent. Furthermore it is perhaps unwise to see Montfort as some reforming idealist – his Mise of Lewes, which significantly curtailed Royal power, was more about ensuring the Earl had the power rather than the King. Overall the revolt did not start an explosion of democracy - it would be almost 400 years before Parliament asserted itself in the Civil War - therefore perhaps, at least in the short to medium term, the most significant outcome of the Battle of Lewes was the experience it gave to Prince Edward. It forged in him a determination to preserve Royal power that would impact upon his later dealings with Wales and Scotland. It also taught Edward much about military manoeuvres; from this point on the future warrior king would never again mount an uphill attack and he put the lessons learnt at Lewes to good effect at Evesham the following year. Blaauw, W and Charles, H.P (1871). The Barons' War including the battles of Lewes and Evesham. Bell and Daldy, London. Brent, C (1995). Historic Lewes and its Buildings. Lewes Town Council, Lewes. Carpenter, D (1987). The Battles of Lewes and Evesham 1264/65. Mercia Publishing, Keele. Lancaster, J.H.D (2012). Lewes: Battlefield visit notes and observations. CastlesFortsBattles.co.uk. Mann, E L (1976). The Battle of Lewes 1264. SB Publications, London. Ordnance Survey (2015). Lewes. 1:1250. Southampton. Prothero, G. W (1877). The life of Simon de Montfort, Earl of Leicester. Longmans Green and Company, London. The battlefield itself is partially buried under modern housing but visitors can walk up the undeveloped area of the hill following in the general direction of the Royalist advance. The difficulty posed by the uphill attack can be clearly appreciated. 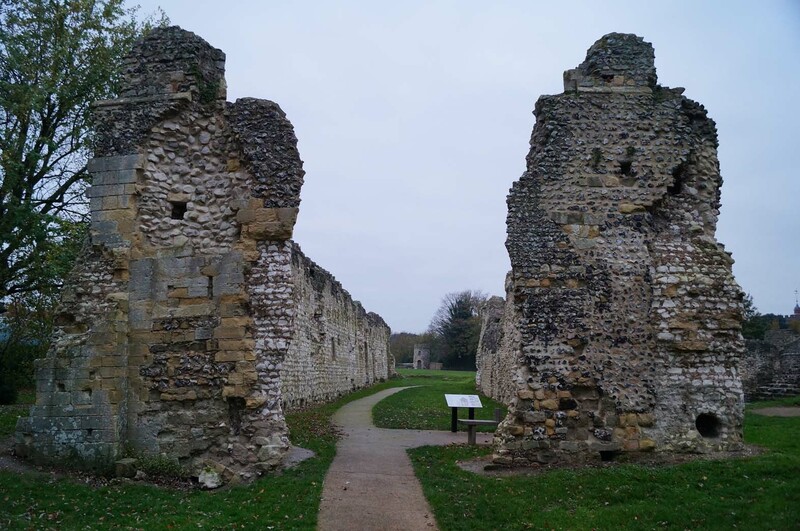 The Priory can also be visited (there is a battlefield monument set within the ruins); this is where the Royalists deployed from and also where the battle ended in street fighting up to and around the Priory Precinct. Nearby Lewes Castle, now a major tourist attraction, is from where Prince Edward deployed for battle. Battlefield. View towards the Royalist position from the centre of Simon de Montfort's line. Offham Hill. The Royalists had to advance uphill towards the summit where Simon de Montfort had deployed his forces. Priory of St Pancras Priory. Henry III stayed at the Priory before the battle and his troops fell back to its gates as they were routed. Priory Ruins. William de Warenne, Earl of Surrey founded the Priory in the late eleventh century but it was later suppressed by Henry VIII. Battle Monument. 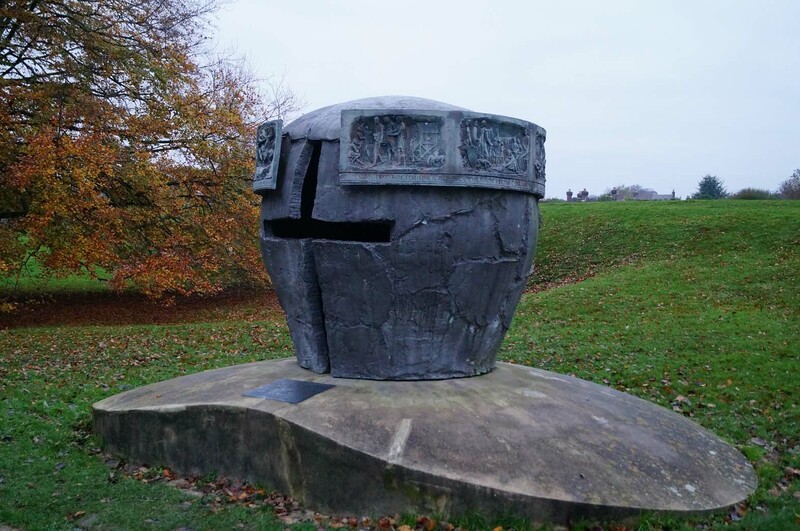 The distinctive monument marking the battle can be found in the grounds of the Priory. The story of the battle is told on the sides of the monument. Lewes Castle. Prince Edward spent the night before the battle at Lewes Castle and deployed from there to the battle. The battlefield is not sign-posted but there are on-road parking options near the path to the summit of Offham Hill. For Lewes Priory there are some signs and a car park in close vicinity. The castle is in the centre of town with numerous car parking facilities nearby (most pay and display).